A fun product! 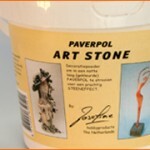 Art Stone can be used in two different ways. You can use it to make self-hardening clay, or you can use the powder to create a stone-look finish to your sculptures. To make a stone finish, use Paverpol with black Pavercolor or Paverpol transparent mixed with Pavercolor Siena as a basis. (Of course, you can also mix with other Pavercolors if desired. You can use a preformed figure of Styrofoam, plaster, paper Mache, or kitchen foil covered with masking tape).